Vance County Community Foundation Board Chair Patricia Newhouse and Treasurer Eva Brown listen as Rebuilding Hope Founder and Director Randolph Wilson explains the work of the non-profit. HENDERSON – Members of the Vance County Community Foundation Board of Directors recently paid a site visit to Rebuilding Hope to learn more about its activities. The Board gave a grant to Rebuilding Hope in 2010 and wanted to see first-hand the work that it’s doing for the community. 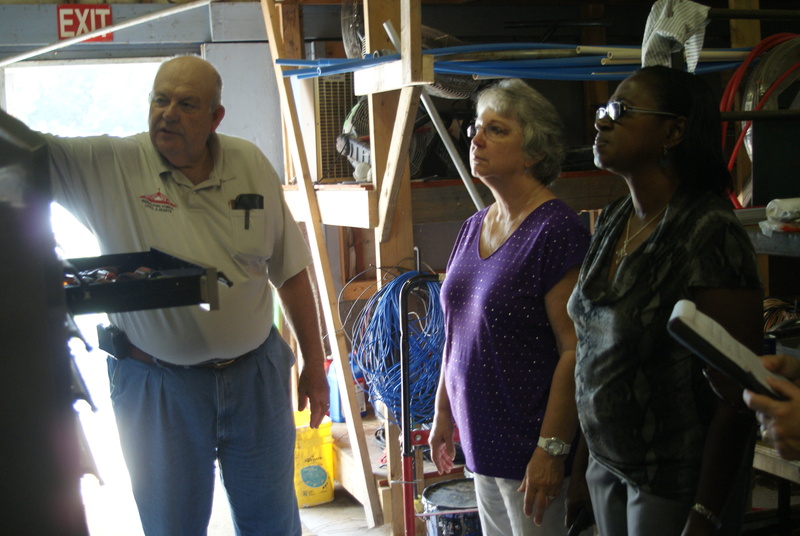 Founder and Director Randolph Wilson gave a tour of the facilities, which includes a warehouse to hold donated construction materials and several manufactured homes. One of its many activities is to repair and send out refurbished mobile homes to other parts of the state that have been hit by disasters, such as Hurricane Irene or the recent wildfire in Eastern North Carolina. Rebuilding Hope also accepts used furniture, linens, workshop tools, and other supplies that will help families get back on their feet. Volunteers are the lifeline for the non-profit agency. To learn more, visit www.rebuilidinghopeinc.org. The Vance County Community Foundation Board members met staff, volunteers, and heard more about the mission and history of Rebuilding Hope. Thanking Mr. Wilson, the Board left enlightened about the many ways the non-profit is helping families in need in the region as well as statewide.